Maxima folding grab bars with warm-to-the-touch vinyl, colors available. 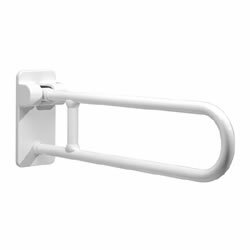 Bar Size: 24" 28" 34"
MAXIMA Series Folding Grab Bars are made of seamless zinc-plated steel pipe, coated with antimicrobial, biocompatible, and warm-to-the-touch vinyl. Available sizes: 23-5/8”, 27-9/16” and 33-1/2”. Optional removable toilet paper holder also available, sold separately. Please allow 2 day lead for White 24" and 34". Please allow 4-6 weeks lead time for all other sizes and colors. Maxima Folding Grab Bars are Custom Order Items. The Adaptive Living Store can not cancel, return or refund custom order items.